Southern-style barbecue by way of Brooklyn. : When Joe Carroll wanted to expand his popular Brooklyn barbecue joint, Philadelphia --- specifically the burgeoning Fishtown neighborhood --- seemed like a good fit. Carroll teamed up with Philly's über restaurateur Stephen Starr to open a local version that serves as a kind of dining companion to Starr's popular Frankford Hall beer garden next door. Fette Sau is a casual spot with a warehouse-chic style --- rough-hewn wooden tables, each with a roll of paper towels at the ready; industrial-style florescent lighting; and a funky bar with beer taps fashioned from butcher's knives. The approach to service is similarly straightforward: you order food at one counter, pick up drinks at the bar, and then wait for a runner to bring the meal to your table. Meats, served on paper plates, are available by the pound, allowing for mixing-and-matching and sharing among fellow diners. 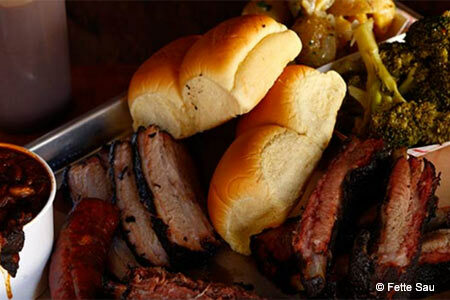 Tender brisket with a coffee-based rub, pork belly, spicy Italian sausage from Nicolosi and a briny pulled pork (perfect for layering with the Asian-style coleslaw on a soft Martin's roll) are the animal stars here. Meat-flecked baked beans and vinegary broccoli salad supply the right complementary notes to this carnivore's delight. You can wash it all down with a changing rotation of nine craft beers by the draft or some 100 North American bourbons and whiskeys. Dessert may seem like gilding the lily, but save room for the delightfully sour Key lime pie, served as a tartlet.